A complete distribution ecosystem, eZee Centrix is the fastest hotel channel manager that provides hotels a one-stop solution to perform real-time rate and inventory updates on connected channels. 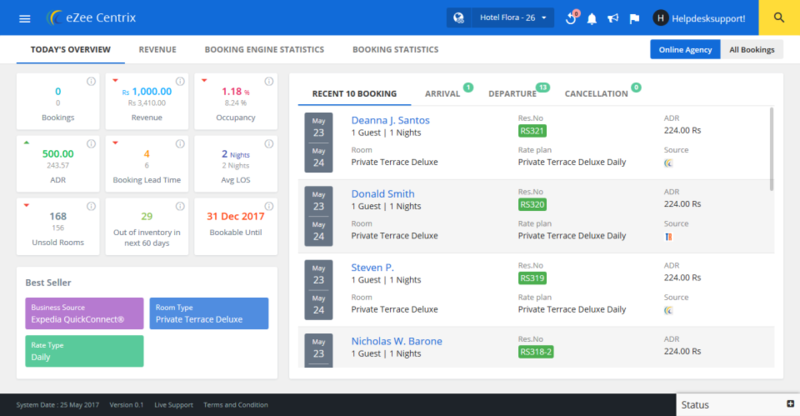 Interfaced with more than 130 global and local online travel agencies (OTAs), global distribution systems (GDSs) and vacation rental portals, eZee Centrix gives a single-point dashboard to hotels for managing distribution channels. eZee Centrix Reviews Recently Reviewed! Pros: We wanted to have a product to manage our hotel but due to lack of understanding what we need and what software we need to choose we delayed in implementing a software for many years. However one of my friend recommended this ezee Centrix, and we took a plunge and established business relationship with ezee. Till date they met each and every requirement for our hotel needs. I believe they have many functionality in Centrix and i am using may be 20-30% of them. As we are a small organization, they are certain tasks still done manually. I believe this solutions is even useful to big companies in hospitality as well as for small & medium companies. over all I am very satisfied. The staff is also very good in looking after their customers. We have been allocated a Cloud Technical expert to our account, who helped us to quickly deploy the sofware through out our organization in a phased and quick manner. Without his contribution we would not have used this software to the maximum of its capacity. Cons: Very sophisticated but still easy to understand and manage. In an organization it needs to be deployed and trained well to use it to the maximum of its potential. Overall very good product. Thank you so much Issouf for sharing your experience of using eZee solutions. It feels great to know what an effective role our solutions are playing in simplifying your operations and giving you your desired ROI. Keep exploring and keep sharing your feedback with us. In case you're stuck anywhere, you can always reach out to the technical expert assigned to you. Regards, Team eZee. Pros: -Have many integration with other PMS,Booking Engine, OTA, etc. -Pricing is the most affordable (ezee ultimate plans 2-3% per booking) for small or starting accomodation because you only pay for what you get. Overall: I am very pleased for what I got with the price I paid for. Hopefully if there is problem with their integration, they can solve it with the third party directly, rather than directing us to solve it ourselves with the third party. We're glad eZee software are working very well for you. If you ever find it difficult to follow any procedures, please look for our video tutorials on YouTube. You can even ask your account manager for detailed software training. Concerning to your OTA issues, we advise you to speak with the respective OTAs because they respond to their client's queries faster. Besides, we believe that you can explain your issues better than us and most importantly, you will get quicker solutions. Moreover, we can only provide you solutions regarding our software, for which we're always eager. Pros: The Channel Manager is very fast, easy to configure and use, with many additional features such as Reputation Management, OTA Promotions (currently Booking.com and Airbnb) and statistics. Thanks to the full integration, all data from the PMS is also available in the Channel Manager, and the app gives you a good overview on the go. Cons: Sometimes certain information about new features may be unavailable in advance. However, this is very rare and eventually you can try it out or ask the support / advisor. Overall: As an entrepreneur, I have evaluated the various suppliers and decided on eZee Technosys and are now working for around two years with their innovative products. Especially the seamless integration of Channel Manager, Property Management System and Booking Engine convinced me. Many OTA's, Rental platforms and many other partners can be integrated. The rooms and guest management is well arranged and guests have the opportunity to book directly, which saves commissions. The 7/24 support is competent and friendly, can quickly find a solution. Thank you for such a detailed review. We are glad that eZee solutions are making your work easier than ever. We promise to keep imparting our best services. Best Channel manager we have used till now. 2. It is very difficult to move from new extranet to older one & vice versa. 3. Ezee must also start a partnership with some of the payment gateways for easy configuration for booking engines. seeing, Railway station pick up & Drop & such other extra chargeable services on booking engine. We had this option in our older channel managers. Hello Naved, thank you for your kind words. To address your cons, we can definitely assure you that we're making the product more user-friendly for you with new features coming up everyday. We have ready integration of our booking engine with several payment gateways, which makes the booking process easier. Do share your requirements and queries with your dedicated account manager, and they'll provide you with the best solution. Keep sharing your feedback at cm@ezeetechnosys.com. Regards, Team eZee. Cons: The best part of this software is , the customer care guys are very helpful and cooperative ........ Mr.Benjamin Lakdawala was the best person form ezee software , his training has helped many hoteliers to handle the ezee software smoothly. Recommendations to other buyers: The best software in hotel industry .........................................................................................!!!!!!! We are glad that you found the training and the customer support up to the mark. Our first priority has always been the satisfaction of our guests. We are glad to know that we are on the right path. We conveyed your thoughts to Benjamin and clearly he was overjoyed. Keep writing to us. Thank you so much. Overall it's a good system. Pros: Full control over everything we need to do, albeit you need to be a rocket scientist to use all of it. Cons: You need to integrate all of it into 1 system with 1 login. I never know where anything is, so it wastes a lot of my valuable time. Ezy Front; Ezy Centrix; Ezy Reservation; Ezy Configuration: Not "Ezy" having 4 different pages to use and understand. Put all of this into 1 "Ezy" system. The "Night Audit" is also quite a painful process, which needs to be simplified. Hi Glen. Thank you for rating us. Regarding the multiple windows, you will also agree that every link is having different working and it is a design demand. However, you can always Bookmark the links in your browser so that whenever the browser is opened the link are accessible. Moreover, your feedback is appreciated and will be forwarded to concerned team for further discussions. Regards, Team eZee. good service with 24 hours live support . Cons: as i start it before six months so i am still searching so many things about it may be that's why some time i feel some difficulty in some things but then with the help of staff it solved so only i think it take time for me to understand different aspects of the system. only some time system does not work for some minutes so in rush days it will be a problem hope it will never happen more often. i understand it normal some errors some times but its ok .
good system in low budget. Hi Asma, thanks a lot for giving us such an amazing review. We hope that your experience with us keeps getting better and better with time and your business grows exponentially using our software. If you've got any queries at anytime, do not hesitate to get in touch with our 24x7 live support. Regards, Team eZee. Pros: Less worry for overbooking, easy to update, saves time for more important tasks, hoped for update on more other bulk functions to make it save even more time. Someone available on support 24/7 in case something goes wrong. Hi, Joseph W. Thanks for your honest review. Regarding cons, we have recently launched a Distribution Wizard which is apt for instant bulk updates. You should give it a try if you haven¿t. Also, we have added a Status Panel in the system which will notify you on the status of the updates you push to the OTAs. For product updates, we are moving towards advanced technology which will ensure no downtime for updates or bug fixes. So rest assured, your requests will be processed in less duration. You can reach our 24x7 live support team and they will further assist you with this. We have expanded our support team 2X in past one year and we continue to hire as required. We hope to serve you even better next time. Please do keep sharing your feedback with us at cm@ezeetechnosys.com Regards, Team eZee. Pros: eZee Technosys, one of the world's leading PMS software tech firms, defines any hotel's functionality needs with a user-friendly software interface and application to transcend one's inability to market and compete with 5-star establishments. Cloud-based applications and interfaces allows one on the go to update, sync all transactions with ease and effectiveness that at Airport View Hotel, an increased turnover & occupancy rates year in year out have been met with much appreciation. Cons: Not to be insincere, i personally don't have a con to state and if i ever had, any other eZee user would state me wrong!!! Overall: Effective and efficient servicing to our hotel clients and corporate companies. Hello Graham, thank You for such an awesome feedback. We assure you to continue giving our best services ahead. Keep sharing your suggestions at cm@ezeetechnosys.com. Regards, Team eZee. Pros: eZee Centrix is a comprehensive and an extremely intuitive channel manager. While managing a chain of properties, the various automation features act as a boon. To top them all, they have an extremely dedicated and proactive team in the back end taking care of issues and development. Overall: Every product in the development phase initially has a number of limitations, the same was the case with eZee. But their endeavour to accept feedbacks and roll out periodic updates has made them one of the most sought after software in the budget hospitality market in India at least! Thanks a ton Deep for such an amazing feedback. Working with clients like you is always delighting. If you ever need any assistance please don't hesitate to contact us. Warm regards from team eZee! A must have hotel software. Pros: eZee centrix is very easy to use. We experience few very problems with it. The software reduces the amount of man power required to manage room inventories and to track reservation. The support is also great with fast responses. Cons: The general experience is quite good. The only thing is that we prefer the old interface more than the new one. Hi. Yuan. Thanks for taking time to rate us. Regarding the cons, the new interface offers more possibilities and exciting features which can quickly trigger your hotel operations to a great extent. However, in case you have missed some of those feel free to book a training on it or write us at cm@ezeetechnosys.com or reach us on our 24x7 live support. Please keep sharing more feedbacks with us. Regards, Team eZee. Hi Mohamed. It gives us immense pleasure to receive the title of 'awesome software'. Thank you for taking out time to write about us. Bhavesh got really motivated by the review. Regarding your concern about government reports, it is known that the government report formats keep on varying. We're striving continually to cope up with these trend, and the last few enhancements in the reports will prove that. Keep dropping your suggestions at cm@ezeetechnosys.com. Pros: Change of rates with one click. 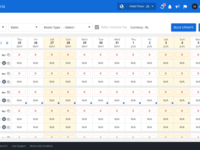 Dinamic way to track bookings, revenue, cancellations, etc. Cons: I´m happy with the improvements made on the new version. The only thing I´d add would be to be able to access 2 different hotels at the same time. 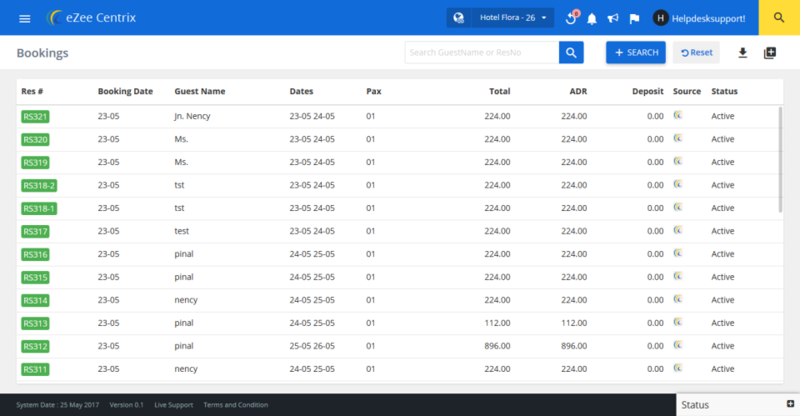 Overall: A easier and better way to keep track of all important information for managing hotels, bookings, revenue, chanels, etc. Pros: the support team is always there to help. the software developers take the issues very seriously to cater for the users. lot of useful reports can be generated in seconds. I am a user from Maldives and tge tech team are very friendly and knowlegable. they always support as and ten require. Cons: I would like to request for customirization of invoices and other documents that the company would raise through the software. Just the expenses can be input at the monent but if detailed input of operational expenses and minibar option for online version would be perfect. Overall: it is easy for booking and intergrated with gaint OTAs. easy to maintain the hotel resevation. can handle accrual and cash basis transections. Hi Ali, thank you for your feedback and appreciating our support and technical team. We have developed extremely generalized and user-friendly invoices, which are widely accepted in the industry. Do send your customization requests at cm@ezeetechnosys.com, and we'll see how we can provide you the best solution after we've performed a feasibity check. Regards, Team eZee. Pros: A secure, user-friendly and modern tech software with around the clock 24*7 support through a Live Chat or any other correspondence to name just one! Cons: Too many extra-net portals to configure same data and mobile apps are not as user -friendly though am sure are in the pipeline. Overall: User friendly system interfaces with cloud storage and around the clock support from eZee tech team. Dear Graham, We are grateful to receive your feedback over here. Appreciation from client always boost the team spirit - many greetings from our support team. You can write to us anytime as we have dedicated account manager to help our clients like you with extra-net portal settings at our end. And we are happy to inform you that we have recently launched the redesigned Absolute Mobile App, you can check its new features on http://ezeeabsolute.com/pmsonmobile.php. Though, you have any queries, you know where to reach us any day. Stay tuned for best of the assistance from team eZee! Hi Luisa, Thanks for taking your precious time to write about us. It is wonderful to know, how our solutions are benefitting you. We regret the inconvenience caused to you due to overbookings. We assure you that we're optimizing our solutions to be flawless, so that your experience becomes more user-friendly with us. In case of any queries, our 24x7 support team is always there to assist you. Hi Irshad, thank you for rating us as an excellent product. Regarding your cons, whenever you face any difficulty, our support team is on the toes to help you resolve your issues. We prefer to do the mapping on channels, in order to avoid any discrepancy. It's great that you want to add more channels. Your account manager will be the best person to help you with this. Regards, Team eZee. Pros: As a reseller partner of eZee we use cloud base hospitality solutions for a year. Both PMS and Channel Manager are easy to use, easy to understand and manage on daily basis even for hoteliers who did not use similar products before. The support are fantastic, 24/7 available, each property has dedicated account manager which making me feel special. Cons: Well, there are no cons at all. Only the time zone distance make the daily operation harder (Europe-India) but the support shift covers the European business hours, so again it is much appreciated! Thanks Kalman for sharing your thoughts with us as our technology partner. You can write to us anytime with your valuable feedback, suggestions and if there is anything we can help you with at cm@ezeetechnosys.com. Regards, Team eZee. Overall: I am managing my entire business inventory over multiple OTA platforms. The process is very easy to execute and adaptable. Thank you for your review. We're glad that eZee Centrix has made your inventory distribution faster and better. We are happy to inform you that we're now staying active on the sales front and other social media platforms with upcoming new releases. You can follow us on Facebook, Twitter, LinkedIn and Instagram for that. In order to make eZee solutions and services better, your suggestions are always welcome at cm@ezeetechnosys.com. Pros: Simplicity & the support is the key behind the effectiveness of the product. The support team is much more responsive. Hi Manoj, thank you for your kind words for our product and services. We're constantly putting in efforts and innovations to help you manage your inventory distribution easily. If you have got any suggestions or queries, you can always get in touch with us at cm@ezeetechnosys.com. Regards, Team eZee. Pros: The easiest way to use it even for training some one for PMS's since our hotel started to run, we became the user of the eZee and it has been working very well and easy to adopt to it. Cons: Pre much I have nothing I have experienced badly that I could mention. It is a new products in the market, but there is a room for improvement. Hi Essau. We are glad to have you onboard for over 2 years. We constantly strive to improve ourselves, you should write to us on cm@ezeetechnosys.com if you have suggestions on the same or reach us on our 24x7x365 live support. Thanks, Team eZee. Pros: It helps maintain your OTA bookings easily. You can easily block you inventory for sold out dates through Stop sell. Update daily inventories on all the OTA's on daily basis. Cons: Its complicated to update rates, as well as the support i recieve in case of any problem is not upto mark. They really have to look into there customer support. Hi Shashank. Thanks for taking time to review us. We have recently launched new features in centrix including quick updates. I hope with this you are no more finding it complicated. We are sorry to hear that you had faced issues in getting quick support. You can always write to us at cm@ezeetechnosys.com if you face similar issues or reach out to your dedicated account manager. We hope to offer you much better support on our 24x7 live support. Regards, Team eZee. Pros: Helped me to increase my bookings by registering with more OTAs. The customer support was really good as well. Sri Lankan team helped us alot. Cons: I prefer if there are more OTAs to connect with and if there is someone to help us on registering with new OTAs. Hello Shashika, we're glad that eZee Centrix is helping you in increasing your revenue. It is great that you want to connect to other OTAs as it will help you in generating more revenue and even expand your online presence. Surely there is a way to connect to other OTAs. Your account manager will be the best person to guide you in this case. Regards, Team eZee. Nice Service. Specially Key Account Manager is helpful. Pros: Up Time & Online Support helps us to use this software comfortably. I personally prefer to use this software to update OTA's in one Go. Cons: Training Dates are not easily available. There should be physical trainer available who can guide executives to perform day to day operation. Overall: Keeping track & updating records online. Hello Saurabh, thank you for your feedback. We suggest you to consider availing our onsite implementation services in order to get your hands on our solutions. On the other hand, your account manager is always at your service in case you're stuck anywhere. Regards, Team eZee. Hi Pragna. Thanks for the ratings. Regarding the cons, we already have a mobile app available for both Android and iOS. Please visit our website http://www.ezeecentrix.com/ for the same. Also, you can reach us on our 24x7 live support with your mobile device details so that we can fix the issue for you. Regards, Team eZee. Hi Suman. Thanks for rating us. Our channel manager mobile app lets you manage the basic inventory distribution functions on the go. While we're working to optimize the channel manager app, we have a complete hotel management app eZee Absolute which helps you in not only your hotel operations, but also in several inventory distribution operations like stop sell, one-click updates and more. Maybe you'd like to try it sometime with our feature-rich PMS if you haven't done it so far. Keep sharing your suggestions at cm@ezeetechnosys.com. Regards, Team eZee. Pros: its convenient to use and its very easy to take the reports and easy to manage check-in and check outs. Cons: try new features and betas / some times bugs issue and need to fix that as some time its very difficult to use it. Hi Hussain, thank you for sharing your feedback about eZee Centrix. We'll definitely consider your suggestion to release new features and make your experience error-free further. If you've got any more suggestions or comments, please reach out to us at cm@ezeetechnosys.com. Regards, Team eZee. Pros: Really easy and very useful tool. Cons: As an Advance User, at time i find it too long to always have to ask the support to do something i know i can. Overall: Honestly, eZee team should left us manage our inventory like we want when having the all in one package. You have limited access due to the security measures taken by your hotel. For more details, speak with your account manager. We promise to impart you our best services. 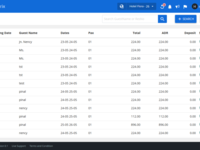 - Easy to manage rate and inventory as well as guests. - Quick to learn how to use system with well-document guidelines. Hi Sophara, Thank you for taking time to write about us. We are delighted to know that you are finding eZee Centrix easy and efficient. Keep sharing your suggestions at cm@ezeetechnosys.com. Regards, Team eZee. Comments: Interfaces with our frontdesk and OTAs, thus allowing to concentrate on our promotions without having to worry about inventory. Does not know how to differentiate between a modified booking from OTA from a original booking. We sometimes gets two booking (and this messes up inventory) when an original booking is modified by a guest who wants to change their credit card information. 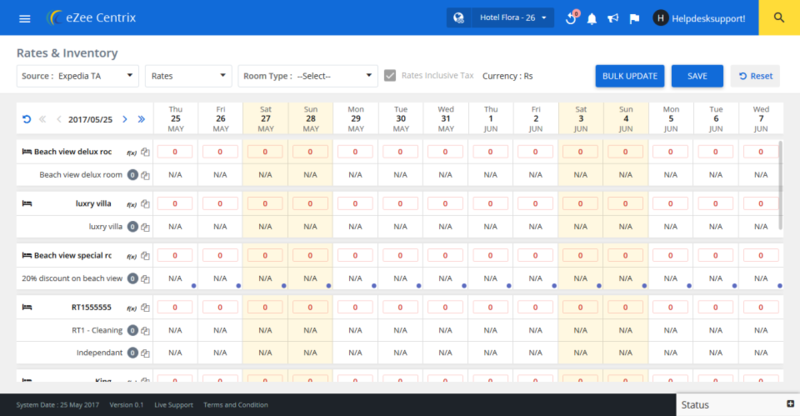 Prices from OTA is also not brought in correctly into our eZee Frontdesk and aslo shows wrong payment type when booking is received from our eZee Reservation. It shows that payment is through one of our OTA when it is not. Mappings can only be handled by eZee staff and it is sometimes hard to get across the message of what we need to be mapped. Addressing your concern for bookings,you get notification for both new and modified bookings to easily identify the modification.Additionally,you receive the booking twice because the OTA itself sends as 2 new bookings.In case this issue prevails,please contact us and we can get in touch with the OTA to get it sorted. To resolve the payment problem,please share the booking Id on 'cm@ezeetechnosys.com',so that we could look into the matter deeply.Besides, some hindrance with configuration settings may also cause this.Kindly provide us with some transaction so that we could make necessary configuration settings in your account. Furthermore,our dedicated team of account managers handles mappings for our clients.If you require any communication with them, please share your views by sending us an e-mail on 'cm@ezeetechnosys.com' or easily schedule a Skype session for the same. For any future assistance,contact us anytime. Pros: many feature that centrix provide. Live support with many helpful people who are always patient and very very helpful in anything that you need. Cons: I work in a partner company of ezee in morocco, sometimes you need the account manager to perform some changes that you need but there is like 5 Hours between india and morocco so the account manager is only availyble in the morning. Hi Erragued, we're glad to know that eZee Centrix and our support team is meeting your expectations to manage your inventory distribution. In case you want few changes implemented while your account manager is unavailable due to time differences, you can always get in touch with our live 24x7 support team to get it done. Regards, Team eZee. It helps to improve our business. Easy to understand. can maintain all OTA'S in a single platform. Pros: The name is in itself( EZEE). Easy to use easy to understand.. we enjoy your products and services,. the software has upgraded magnificently into a complex yet user friendly with various useful features added periodically. Cons: not everything. 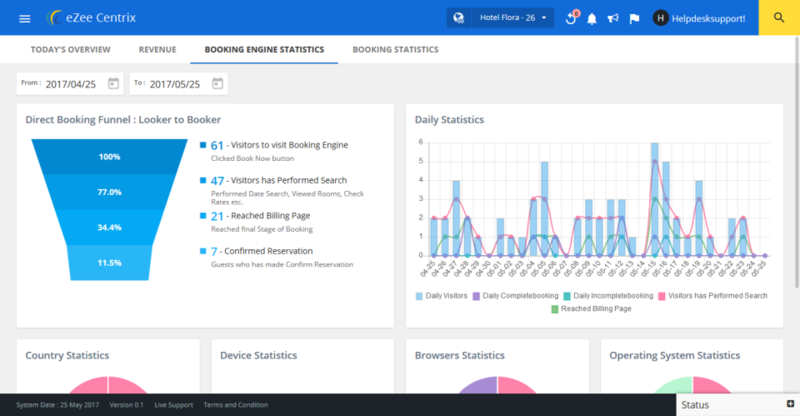 it works smoothly, faces small errors, which related to booking engine. e.g generation of reservation requests. Hi Kumar, We admire your optimistic response to our software and the way you relate our company name. For reservation request and issues related to booking engine, we recommend you to contact your account manager who is on toes to help you right away. We regret the inconvenience caused. Best Regards, Team eZee. Pros: easy to operate.handy.all mis.supportive. great interaction.friendly approach nothing much to write . Cons: Small hoteliers like us doest use most of the features provided as we werent properly aware of those. I think explaining the importance of any unused features or making any such awareness might be very much useful for us. Hi Karthik, Thanks for taking time to rate us. Regarding cons, we do offer free unlimited training and cover all the features under it. You can reach us on our 24x7 live support and discuss and schedule your training with us and we will explain you all the features our channel manager has to offer. Regards, Team eZee. Pros: They promise a lot but you will never find delivery on promises. They advertise things on their website which is not even ready. One example is Airbnb two way connection. Its not yet ready but they have been advertising is on the website for a few months now. SMS gateway interaction is not yet ready, they have been advertising in website. Cons: Not flexible enough for growing companies. If you have a 4-5 room hotel, may be it work for you but all other claims are juts claims and have no connections with reality. Overall: They promise a lot but you will never find delivery on promises. They advertise things on their website which is not even ready. One example is Airbnb two way connection. Its not yet ready but they have been advertising is on the website for a few months now. DO NOT get caught. It is a big decision for hoteliers to choose right CRS as it is painful to keep moving from one to another. Save your time and stay away from this one. Hello Pawan, we're so sorry for the inconvenience caused to you. We'd like to tell you that 2-way Airbnb integration has been made live around four months ago. While concerning with your other cons, we would like to assure you that we've already escalated your queries to the concerned team, and they're looking into it at the earliest. We request you to remain in touch with your account manager for any further updates. We promise you to give our best efforts in solving your problems to make sure you don't face them again. Pros: Easy system and always ready to help us. We are working with ezee for many years now and we hope to keep working with it. Thank you for your review. It feels great to know that you are finding our software very efficient. Also, we are delighted to know that you find the support of our team and representatives worthy. We'll continue giving you the best experience and solution to manage your operations. Pros: The technical team is always available for the support and solve all the queries without any delay. Also since we are a hotel consultancy company, we get customized services which makes it easy for us to bring more revenue to the hotels. Cons: We have nothing to talk about the cons here as we do get the correct services for all our needs. Overall: To increase our visibility among the Online Travel Agents and increase the revenue. Hi Ashfaq. Thank you for taking time to review us. We are really glad to know how your services are getting accelerated through our solutions and services. Thanks for admiring our support team. Regards, Team eZee. Pros: As compared to other software, it is easy to use. Reports are easily available of the business & can be compared with the targets set. Cons: The main problem we are facing is while running the promotion. I would suggest that there can some reports where it can show business before & after the taxes for a period required. Hi Swapnil, Happy to find that you are getting rewarded with channel manager eZee Centrix. We do have reports which let you know that how your promotions are performing and more. We suggest to get in touch with your account manager, who¿ll be the right person to guide you instantly. Thank you and Best Regards, Team eZee. Pros: A lot of OTA have connection, synchronization with front desk, good support, many options and settings. We have a personal manager and they are always helpful. Cons: some options need to use with support help only, but support is always helpful. This is not a flawed fault. Hi Ekaterina, Thank you for giving your valuable feedback. We are pleased to hear that your operations got streamlined with eZee Centrix. Regarding your mentioned cons, initially, you might need the help of support for some options. Once you get handy with the software, it will get easy for you. Please keep sharing your valuable feedbacks at cm@ezeetechnosys.com. Regards, Team eZee. Cons: Yield Manajemen : help me to manage the best rate to each OTA . This feature will automaticly update rate to all OTA. Overall: I gained the trust of the owner and really helped to raise the occupancy of the hotel. Hi Ferry, we're extremely happy to see your review here. Parth is pleased to see that you're happy with the assistance he provided. We're sure that eZee Centrix will benefit you much more with time with happier guests and increased revenue. If you have any queries, Parth and our 24x7 live support is always ready to help. Regards, Team eZee. I'm not familiar with pricing system and other features but I can get used to eZee pretty fast. Cons: Not sync with Trip Advisor Rental Holidays. Overall: eZee Centrix is definitely making the price update,availability update faster because you don't have to login onto different OTA account. The support from the eZee Centrix is excellent. Our channel manager, rep is incredibly patient and always available to assist, regardless the time (sometimes I forgot the different time zone). The training session rep conducted for me was very clear. He really took his time to explain every feature, I wasn't really familiar with revenue management,so I was a bit slow and asked many questions. Overall, Excellence is the only word I can describe eZee Centrix! Please speak with your account manager whenever you face any conceptual or technical problems. You can even contact our 24x7x365 live support regarding the same. Moreover, we are working on getting connected with the TripAdvisor Rental Holidays. Meanwhile, if you have any suggestion regarding our software or services, please send them to cm@ezeetechnosys.com. We promise to keep providing our best services. Good system, with amazing team, Representatives are nice always helping with anything we need"
Pros: Easy system and always ready to help us, we are working with Ezee since 2 years and we hope to keep working with it. Cons: The best part of this software is , the customer care guys are very helpful and cooperative, their training and technical Support was very helpful to handle the ezee software smoothly. Overall: The best Hotel software comparing any other software..its easy to use ..
Pros: Very comprehensive in terms of features. Everything relating to reservation, front office and statistical reports is set out very logically and intuitively. Cons: Some parts are not amenable to end-user input. For instance, placing the logo and address of the property on the masthead of the invoice print-out is not user-friendly. Hi Vijayan, We appreciate your kind words and are pleased to know that our software is working best for you. As far as placing your property logo on the masthead of the invoice, we recommend you to contact our support team. They¿ll be able to guide you best on this. Best Regards, Team eZee. 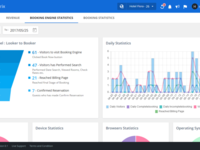 eZee Centrix makes dealing with OTA's and booking engines easy. 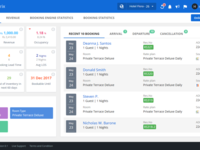 Pros: What I enjoyed most about Centrix is the statistical information available instantly allowing hoteliers the ability to manage their online rates strategy with ease and confidence that they have a holistic view of the various channels and engines. The system is user friendly and easy to navigate and use. It really does make managing your inventory and rates to the various OTA's less labour intensive. Cons: I deal with many hotels and have very few feature requests for this particular product, I believe this is due to it already catering for the majority of the hoteliers needs. Hi Michelle. Thanks for your valuable feedback. Keep sharing your thoughts with us at cm@ezeetechnosys.com. Best regards, Team eZee. Comments: After conducting a market study for cloud PMS's I found this was the best by far value for money channel manager I could get. This was back in 2012 and by then I was the first user in my country. Now they are hundreds. Even so support keeps being helpful and development is open to improvements by from the feedback we have offered. Hi Adegas, it's feels great to see your review here. We promise to continue imparting the best of solutions and services to you further ahead. Regards, Team eZee. - There should be quick tab to check availability at a glance in the Mobile App. - Have to refer old extranet and new extranet. Thank you for feedback, we're glad that eZee Centrix is making your work easier. Addresing to your problem of not being able to check your occupancy ratio, please contact our 24x7x365 live support or your account manager. Hi Ahmed. Thanks for taking time to rate us and for appreaciating our support team and Farhim. They are really excited to hear from you. Regards, Team eZee. Comments: we started with Ezee 3 years back, and i would say that its running good especially if you have only 1 property and don't want to pay for a fortune, while Ezee are offering the same with a competitive price. We have always believed that there is no point in being innovative if the product doesn¿t turn out to be user friendly. Glad to know that you found eZee Centrix flawless, easy and friendly. Keep writing to us. It is very user friendly as it is very easy to use. The support staff is available 24/7. Pros: User-friendly as it is not complex to use. The customer support is available 24/7 and is ready to help with any problem at anytime. The training given by the team is very good and clears any doubts immediately. The software reduces the amount of work required to in managing room inventories, rates and it is easy to track any reservation. Cons: We have faced no issues or problems while working with eZee Technosys for now. So there are no cons to list. Thank you for your positive feedback. We are glad that eZee Centrix has reduced your work and efforts spent in managing reservation and inventory. We assure you that we'll keep up with our best services.